What is Zantac RX used for? Zantac RX is a stomach acid inhibitor. It contains the active ingredient ranitidine, which reduces the amount of acid produced by cells in the lining of the stomach. This is helpful in the treatment of symptoms caused by too much acid being produced in the stomach, such as acid reflux or heartburn (reflux oesophagitis) and stomach pain. You can order Zantac RX online via a Dokteronline.com partner pharmacy. Zantac RX is a prescription-only medicine that can be obtained through an online consultation. 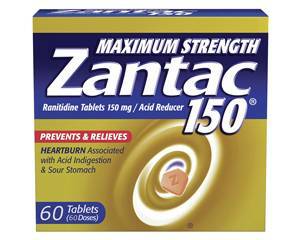 Zantac RX is used to treat stomach ulcers, ulcers of the upper part of the intestine, acid reflux or oesophagitis (inflammation of the oesophagus). It works by reducing the amount of acid produced by your stomach. This allows the gastrointestinal mucous membranes to relax and heal. Zantac RX may also be prescribed to protect the stomach from possible problems, for example in the case of recurrent peptic ulcers or bleeding. Zantac RX tablets should be swallowed whole with some water. The best time to take your tablet is before bedtime. If you are taking more than one dose, it's important to space the doses evenly throughout the day to keep levels in the body constant. If you have forgotten to take a dose, you should take it as soon as you remember, unless it is almost time for your next scheduled dose. Never take a double dose to make up for the forgotten one. The duration of treatment should be determined by a doctor. Consult a doctor if your symptoms do not improve or appear to worsen. 300 mg once daily (bedtime), or 150 mg twice daily (morning and bedtime). The appropriate dose for children should be determined by a doctor. Read the package leaflet before use. Most side effects are usually only temporary and will disappear once the body adjusts to the medicine. If this is not the case or if your symptoms get worse, consult a doctor. For more information on side effects, see the package leaflet. You have health problems such as a liver, kidney or blood disease, a heart condition or diabetes. Zantac RX may interact with some medicines. It is therefore important that you tell the doctor what other medicines you are currently taking when you order. Zantac RX should not be used by pregnant or breastfeeding women without consulting a doctor first. Zantac RX may cause dizziness. Avoid driving if you experience this side effect. Avoid drinking alcohol while taking this medicine as this is likely to worsen your stomach problems.